Blogger Mary Ann (sans the Professor) just launched Handmade Monday, a place for crafters, scrappers, and other artsy Creatives to post their creations once a week. Ok, so maybe amazingly awesome isn’t the word, but at least it’s festive. 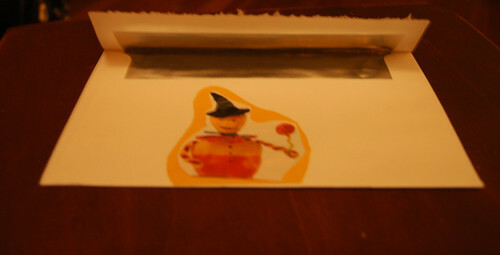 The envelope was decorated with a cut-out from a Halloween-themed Country Living magazine I found in the decorations box (2005 issue), some left-over scrapping paper and cut-outs from candy wrappers. Thanks to Karen for this tip! 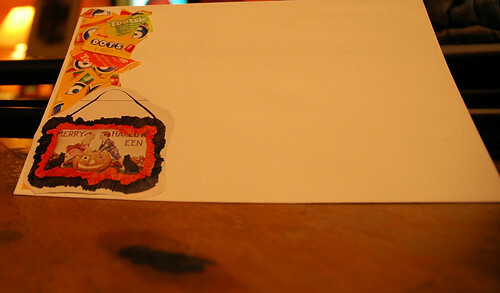 Prizes Secured for Blogtoberfest Guest Post Contest!